Like Obama, Companies Sell Own Brand Of Change During his election campaign, Barack Obama branded a message of change with the word "hope" and the slogan "Yes We Can." Now companies such as Ben & Jerry's, PepsiCo and IKEA appear to be riding the Obama wave by using themes of change and optimism to sell products. 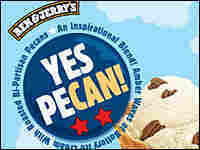 Ben & Jerry's ice cream flavor "Yes Pecan!" was inspired by a blog comment on my.barackobama.com. 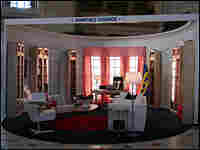 An IKEA Oval Office replica sits in Union Station in Washington, D.C. The Swedish furniture company is now using slogans such as "Change begins at home." More than any other presidential candidate in recent memory, President-elect Barack Obama was a master of branding. And now some companies appear to be riding the Obama wave by selling their own brand of change. Ice cream maker Ben & Jerry's is known for its topical flavors, so perhaps it isn't a surprise that the company's latest treat is called Yes Pecan! — as in "Yes We Can," an Obama campaign motto, except with nuts. 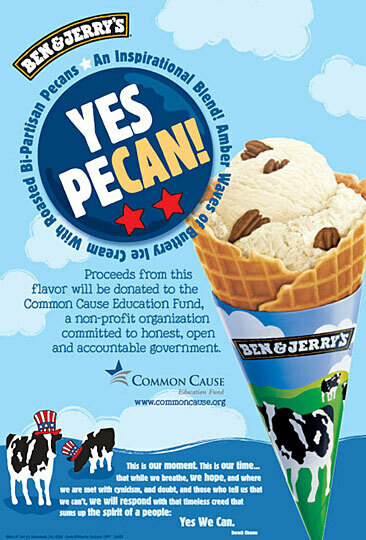 Ben & Jerry's describes the flavor as "roasted nonpartisan pecans" surrounded by "amber waves of buttery ice cream." 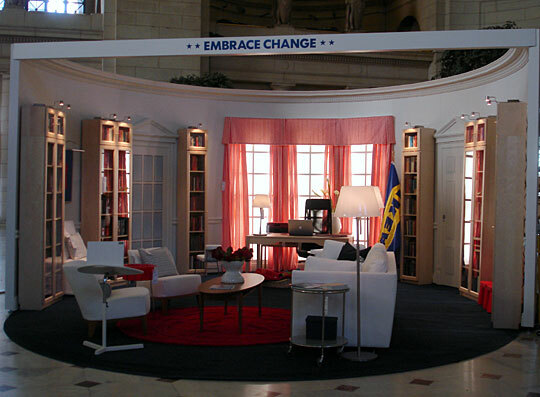 At Washington, D.C.'s Union Station, furniture store IKEA set up its own version of the Oval Office for a campaign it's calling "Embrace Change '09." There are even campaign buttons. "We've created a replica of the Oval Office, using IKEA furnishings," says Marty Marston, public relations manager for IKEA in the United States. The Swedish company made its name with sleek designs and cheap bookcases, and there are quite a few of those in this Oval Office. Marston says IKEA advertisements around Washington include slogans like "It's time for fiscal responsibility" and "Change begins at home." "We really believe that change starts at home," Marston says. "If we think about what's going to happen in the White House — I mean that certainly is the most iconic home in the world, and change is about to occur there." Commuter Vanessa Porter grabs a catalog as she runs off to work. The not-so-subtle tie-in to the inauguration and President-elect Obama doesn't bother her a bit. "I think it's a great idea ... over a million people are going to be here this weekend," says Porter. "Why not?" Porter says many other companies are adopting similar marketing campaigns. Take the new Pepsi logo, for example. "I think whether Pepsi meant it or not or whether they'd like it to or not, there is sort of a blatant visual symbolism there," says Ken Wheaton, an editor at Advertising Age. "Their new logo looks quite similar to Obama's logo." Pepsi officials deny the connection. But there's no denying the bubbly drink's maker has picked up on some of the themes of Obama's campaign. In a recent television ad, the Pepsi logo flashes on a brightly colored screen. It includes the phrase, "It's time for optimism." And there are outdoor signs, too, declaring "Yes You Can" and "All for One." The O's are replaced with Pepsi logos. "There's this hunger, this need for hope and optimism, and it aligns well with our brand," says Frank Cooper, vice president of portfolio brands at Pepsi-Cola. "We didn't set out to kind of align ourselves and say let's deconstruct Barack Obama's campaign and see if we can understand how he developed that as a brand. It just so happens that as we looked at the underlying trends in culture today, we saw the same thing." Coincidence or not, Adonis Hoffman, senior vice president at the American Association of Advertising Agencies, isn't surprised that this is happening. He says something similar happened with some of President Reagan's campaign themes. "We saw a little bit of that creep into some commercial marketing and commercial messaging," says Hoffman, "but my recollection [is] — and I was around during those days — not anything as widespread as what we've seen with President-elect Obama's brand and messaging and the resonance that it has had ... with commercial marketers." Using Obama's themes in advertising does carry some risk: It could upset the millions of people who voted for other candidates.